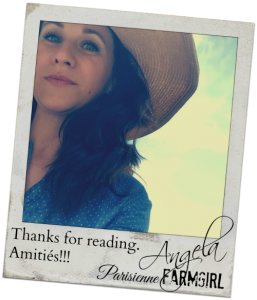 Closing Thoughts: How Fresh Starts stir the goal setting maniac in me! I’m all for fresh starts. About three some odd months ago God got my (our) attention. Like a two-by-four to the visage people. WHACK! It was clear our family was not done growing. Call it a vision, premonition (stay with me here)... call it what you like, but it was very real and it happened to both Joel and I and then a few weeks later to our ten-year-old, and it was clear that we were missing a child. Do you have warm fuzzies? God made it pretty clear I was to have another baby. Well, you know what God? If you could just drop that bad boy down into my lap I’d be fine with it. Babies, newborns and motherhood, for the most part, doesn’t faze me. God has blessed me with a VERY tall cup that takes a long time to fill (IE: it takes a lot for me to stroke out). But pregnancy? Just kill me. Cause I’m dying. The last three months were supposed to be this time of hype and excitement…. dare I say… success? I was birthing my book after a year and a half of labouring on it. Instead, I’ve been curled up in the fetal position or puking up my spleen an average of fifteen times a day. The filth began to gather in the corners, the laundry began to reach the depth of the shallow end of a swimming pool, my hair got greasy and good lord – my thighs? What happened? I have no idea… but it’s terribly unjust considering the amount of food that has NOT stayed in my body for the last three months. “I didn’t want this, I didn’t want this, I didn’t want this.” has been my mantra. You see, as much as I long to be, apparently I am not that “Oh, God opens and closes the womb” woman. Had you fooled didn’t I? I wish I was her, I mean… I sort of feel like I was. “Open to life” as my beautiful friend Rose calls it. But, if I was honest I’d tell you how happy I was to finally be “myself” after ten years of vomiting, newborns, nursing and diapers. Going away with my husband for the first time in a decade seemed a possibility. So did pastry classes in Chicago. Kayaking on the local river as a hobby. Antiquing with my Momma. I was TOTALLY into my groove and loving every minute of it. The cry of my heart has not changed from “I don’t want this” yet. Please understand, the “this” is not the beautiful baby inside me. I love this baby. I can smell him. Hear him. (Yes, we’re PRAYING for a “him”). It’s the sheer misery I’ve been in. My oesophagus will never be the same. It’s the coming tailbone pain and excruciating hip pain, it’s the heart attach like heartburn and the labour… I can’t even think about the labour. See – I’m still in full-blown pity party stage. That happens when you’re throwing up all day. I rage “I don’t want this!” and a tiny, weak voice in my heart says, “Thy will be done.” But I’m telling you truthfully, right now, it’s a tiny, weak voice. After a few days of sporadic relief, I am having another day here was I wonder HOW I will make it. My stomach is killing me. Every bite I put in my mouth destroys me. My poor friends are so anxious for me to feel better, (I mean, I’d be sick of me by this point!!!) “How are you doing?” they ask, hoping for good news. I’ll be fourteen weeks by the year’s end – trust me – I long to give them some good news soon. I tell myself I will make it but sometimes I wonder if I’m going to crack up in the meantime. Truth be told, I cracked up like an hour ago. I do know one thing though – this whole drama has shown me the love of my true friends and my church family. Like, WOW. Friends that drove an hour out to the boonies here to deliver food, friends that just stopped by with chocolates and a hug (cause they knew I’d deny them entry if they called first), friends that came over, bossed my kids around, cleared my dishes and made dinner... friends that live clear across the country that had surprise pizza’s delivered on a day where I didn’t think I could make it one-more-second. Then suddenly we found ourselves on the church list for meal delivery and in the two weeks before Christmas, we were blessed with three hot meals that I didn’t have to make. It’s been BEAUTIFUL and it’s totally made an impression on my children… what it means to give. I doubt they’ll ever forget it. I know this too… somewhere deep down I know I can do this. God called me to this and with his help and abundant Grace I can do this. I know how crappy one can feel when pregnant – no matter how desired that precious child is. I felt great the first two weeks I knew I was pregnant, and then it was all downhill from there. You remember! It was AWFUL, but I’d do it again in a heartbeat if I could. All you can do is take it one day (or one hour) at a time. I hope your awesome family and friends will continue helping out, and that the days will go by fast. I just wrote this whole long thing and then hubby unplugged the computer. GRRR. I getcha. I am having a pity party myself with this move…I really hate Idaho. I know it’s not helpful and probably annoying to hear, but rest in Christ. He knows what He expects of you…and in certain seasons that’s not a whole hell of a lot. Spend time resting, reading to littles when you can summon the strength, and just be. Let the rest go. I know…so much easier said than done. If I were there I’d be helping. Praying for you. From a person who never had any sickness with pregnancy, not one day, and who wanted so many more children than the two I dearly love and have, there is a reason for this baby and for what you are going through right now, even though I know it doesn’t help to hear that. But, believe me, the blessings this new baby will bring you over the next 50 years are gifts that will drop along the way, and soon, the memory of the misery will be gone with the wind. I am so sorry you are having such a miserable time. It breaks my heart. I pray this part passes very soon and you can move on to feeling better. I love you so much! Ok it’s settled I am ordering your beautiful book today to support the new addition to the family! I understand your honest mixed feelings. I am going to pray the nausea away for you…been there…it’s rough and makes things seem insurmountable. May The Lord shower fresh Blessings on your beautiful family and make your paths straight. As an older woman who reads your blog, and shares many of your interests….I have never felt the urge to add a comment, but this time was different….. I look back on my small surprise gift that came to me, age 39 turning 40. The youngest of five, she has blessed our family in ways I would have never thought of during my pregnancy. I will keep you in my thoughts and prayers as you embark this next journey. I’m crying right along with you … not because I’m preggers, but out of sympathy … YOU will get through this time … your children will love you for it and your little baby. It is a blessing your husband is available. It is a blessing that your friends and family have rallied around you. Hang in there … relief will come soon … it will. Just hang on. I appreciate your honesty. It upsets me when Christians try to play nice and gloss over difficulty. I’ll be praying for you. Just a note to say that I’m so thankful that you were able to birth your cookbook prior to this trying time….Timing is everything, isn’t it? I have to tell you that I own more cookbooks than necessary, a ridiculous habit of mine. But, yours is the most beautiful work of culinary art and inspiration ever! Those who might stumble upon my comment, order it now and throw the others out! Praying for you during your struggle through this yucky part. May you be blessed with comfort and joy. Angela, you answered it, all your reasoning as to why? And you didn’t want this now! Was already set in motion as to what was to take place. Yes my dear you know the answer, Gods plan is fulfilled, and the best is yet to come. Who would know better as to doing a baby book? A healthy cook book for baby foods from the Farm to the baby Plate…. You could do your next book and cover it all, little recipes, cookies and treats, sewing for the wee ones and even a little apron pattern tear out page could be included. Who needs abs anyway, when your family has a beautiful Mom like you. Plus you have the cutest little bunch of babies in blog land. Your a Mom to love and other moms look up to you, and perhaps even envy you a bit in a good way. Keep seeking him first and you will be blessed. Yes, my dear God had plans for you. Oh, this brings back so many memories! I SUFFERED hyperemesis also, as did my mom, aunt, and both my daughters. Eldest daughter was hospitalized multiple times and on home health for hydration and then full nutrition. My daughter and I also both suffered from the terrible mouth watering caused by hormones. The Home Health nurses said they saw this a lot in their job, but strange that most women I knew said how wonderful they felt when they were pregnant. That does NOT help, does it? So, I really, really do know how miserable you feel—and I know that you remind yourself everyday that this will pass. I hope your church continues to help you–and for those who cannot always fix a meal, paper plates, cups help when you just cannot face the smells of those dirty dishes! Praying you feel better soon! 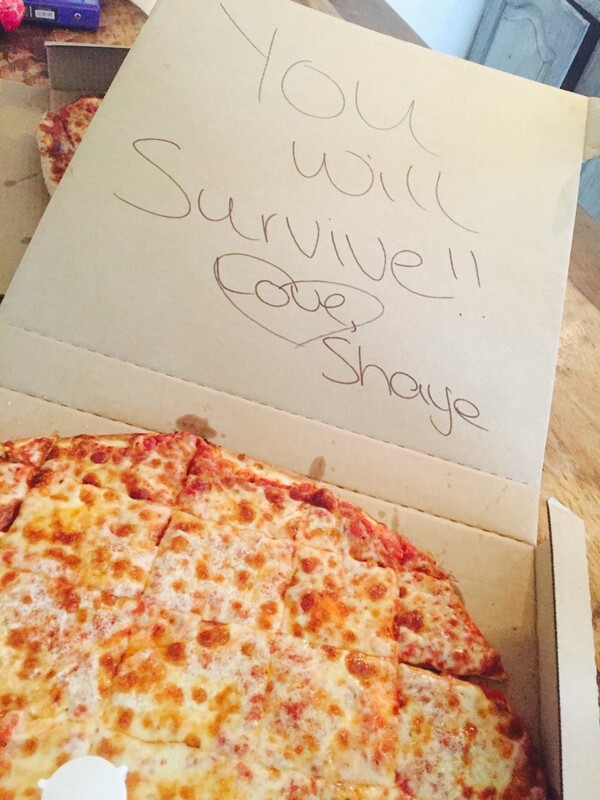 Like the pizza box says, you will survive. No one knows what you’re really going through until they’ve puked like you’ve puked. ‘Nuff said. I am so disgusted by this post. I sincerely used to enjoy coming to this site. I used to enjoy looking at the photos of your home, tutorials, recipes… now I just feel disappointed. I was very excited to see you had published a cook book. I had even been genuinely excited to order it and try out the recipes. In a world where women are struggling against infertility and the emotional battle that goes hand in hand, reading something like this turns my stomach. Just on principle, I would never order the cook book or buy a drop of your essential oils. You sound like a spoiled brat. I can’t even believe that you are a self professed Christian woman. You have disappointed me for the last time reading this post. I will never return to this site again and consider wasting my time reading any more of your words. This post was the final straw. Do with this comment what you will. Delete it. Share it. I don’t care, but I felt compelled to let you know just how I feel, after all, that’s what the comments section is for, right? I wish you luck with your new baby. Even if you sound ridiculously ungrateful for it. If I had been vomiting 15 times a day, curled up on the bathroom floor sobbing with exhaustion, wondering if my teeth will stop chipping (because of the upturned stomach acid) because of Chemotherapy, I would most likely have your utmost sympathy and prayers. However, my condition “hyperemesis” is pregnancy induced and so I should not be allowed to feel emotionally exhausted, despondent or wonder how I can go on one more day. I should only be grateful. Because after all, there are women all over the world, some of them in fact, my friends who would love to be expecting a baby. I suppose I should relish every body-wracking contraction and savor each moment as I am delirious with pain as I give birth too and never mention how painful it is either? If I sound like a spoiled brat then may I say, you sound very bitter. I am sorry you have no empathy for others struggles. And, as I am for anyone who can not carry a child, I am sorry truly for that too. Thank you for the honesty of your post, Angela! Pregnancy is awful for me too and I feel so understood after reading this.